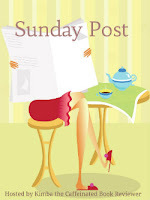 Sunday's Weekly Book Recap #10 was originally published by Catherine for bookclublibrarian.com. This post cannot be republished without express written consent. Curious about Movement of the Stars. Hope you enjoy all of the new books. I need to read Beautiful Disaster - it's been on my list for too long! I'm enjoying The Movement of Stars...it's a historical novel set in a Quaker community on Nantucket island in the 1860's. The story was inspired by the first professional American female astronomer. I totally agree...I purchased it in the hope of reading both Beautiful Disaster and the ARC of Walking Disaster back to back. Nice haul. I hope you enjoy them. Have a wonderful week. Beautiful Disaster was pretty good, but get ready for an emotional rollercoaster lol. Hope you enjoy all your books. Swan Loch sounds intriguing. Hope you enjoy! The Movement of Stars sounds lovely, hope you're enjoying it! I saw the Da Vinci Code was free this week too and I downloaded it for a future re-read. :) Happy Reading! Loved Beautiful Disaster. Can't wait to read Walking Disaster!! Hope you enjoy them! Thanks, Jenea! Hope you have a great week, too.